SCVHistory.com | Letter from Charley Mack to Fred Lamkin Authorizing Construction of House in Newhall, 7-16-1929. In addition to being the local Chevrolet dealer and a Newhall School Board member for a number of years, Fred Lamkin was a builder of single- and multi-family homes and commercial projects in the Newhall area. 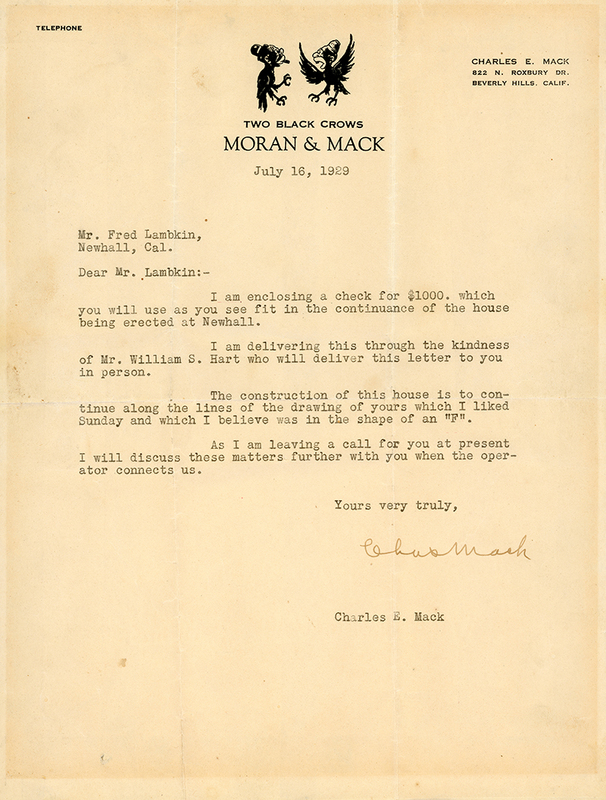 This letter from the popular blackface comedian Charles E. "Charley" Mack authorizes Lamkin (misspelled Lambkin) to proceed with construction of a house based on Lamkin's design. The timing of this letter suggests Lamkin designed and built at least one of the three French Norman or "gingerbread"-style houses on 8th Street that comprised Mack's "Crowland" compound. Mack's main house at 22931 8th Street started construction in 1928 and was completed in 1929 (and expanded or remodeled in 1931). This letter is dated July 1929. Both of the other houses at the top of the 8th Street hill were completed in 1930 (per Assessor records). Only one of the three can be said to be in the shape of an "F," as indicated in this letter: the one at the top of the hill, 23031 8th Street. The house at the top happens to be the largest of the three at 3,605 square feet with four bedrooms and five bathrooms. The house next to it at 23021 8th Street is the smallest, a "T"-shaped, 1,392-square-foot 2-plus-2. The main house at the corner of 8th and Wayman is a rectangular, 2,432-square-foot 4-plus-3. Why Mack needed more bathrooms than bedrooms in his biggest house is anyone's guess. Perhaps he intended to do some major entertaining. Ultimately he didn't get a lot of use out of Crowland; he died in a car crash in Arizona on January 11, 1934. I am enclosing a check for $1000. which you will use as you see fit in the continuance of the house being erected at Newhall. I am delivering this through the kindness of Mr. William S. Hart who will deliver this letter to you in person. The construction of this house is to continue along the lines of the drawing of yours which I liked Sunday and which I believe was in the shape of an "F". As I am leaving a call for you at present I will discuss these matters further with you when the operator connects us. TL2901: 9600 dpi jpeg from original letter purchased 10-19-2017 by Leon Worden.